I've got another round up of one-coat wonders for you that I've come across in my stash. 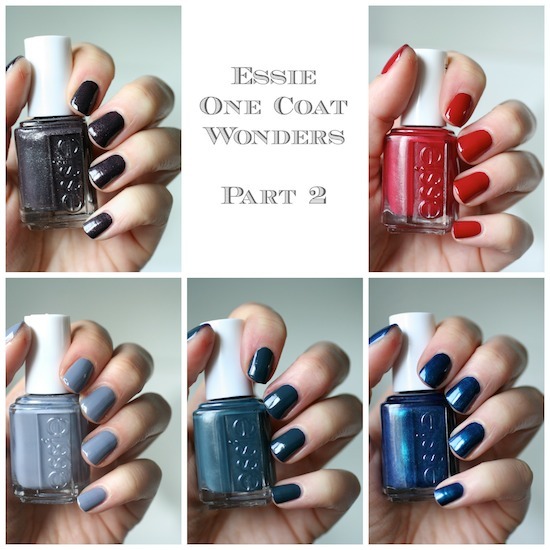 As I said in Part 1 of this series, a one-coat wonder is a polish that you can apply in only one coat which is AMAZING when you are in a hurry and don't have time to paint a bunch of coats of nail polish. Literally one coat of polish and you are done. I actually use these lists myself and refer back to them at times! In the past I've found myself (on more than one occasion) running around getting myself and four kids ready in the morning when I'll look down and see that my nail polish is chipped and needs to be removed or that I forgot to paint them. I feel really naked without painted nails, so knowing which polishes can be applied in one quick coat is a lifesaver on days like those! 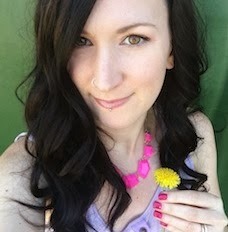 This roundup also became sort of "Fall Themed", since these are all perfect colours to wear in the Fall/Winter months. There are three more polishes in Part 1 that are also from previous fall collections so check those out too if you need more inspiration. This polish is one that I recently borrowed from my friend Austrian because I've always been curious to see how the colour compares to Mind Your Mittens (comparison coming soon!) Anyways, I sat down to apply it and it was this crazy dream polish. It is incredibly pigmented but not too thick of a formula, making it easy to control and apply. All you need is one regular coat and it's perfect. I've tried this polish several times in the last few days since I borrowed it and every time I put it on I'm amazed at how easy and perfect it is. This polish came out recently in the Fall 2015 Collection called Leggy Legend. 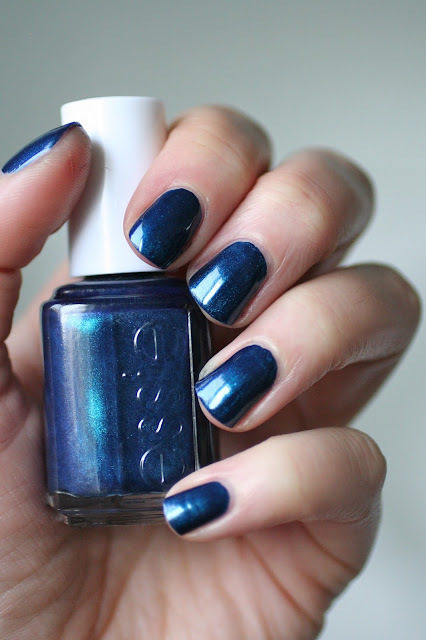 It's a gorgeous shimmery deep blue and applies incredibly well in one stroke. Easy to apply and great at self-levelling, it's another perfect polish in one regular coat. I've seen others say that this polish needs two coats to get the depth of shimmer, but it looks exactly the same to my eye when I apply one coat as when I apply two. This was another polish released this year, although this came from the Spring collection called Flowerista. 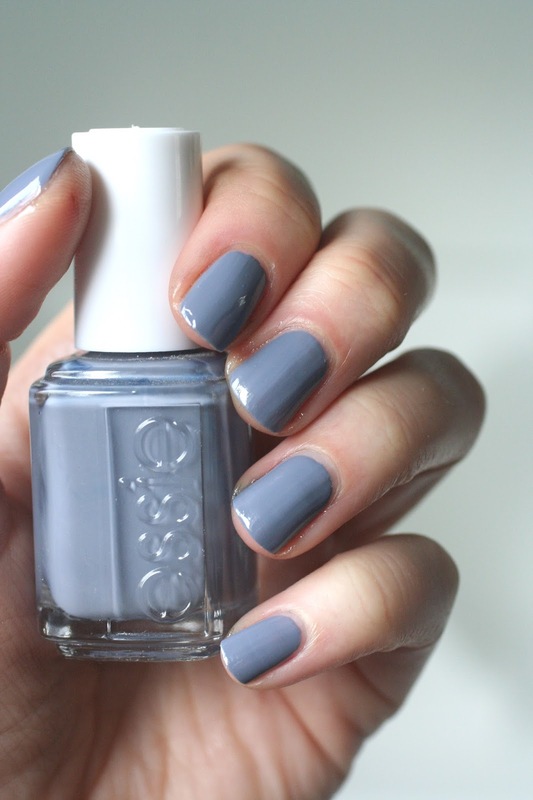 I loved the slate grey colour of this polish but found myself never wearing it in the Spring and Summer. Now that Fall is here I feel like it's perfect to pull out and start wearing. 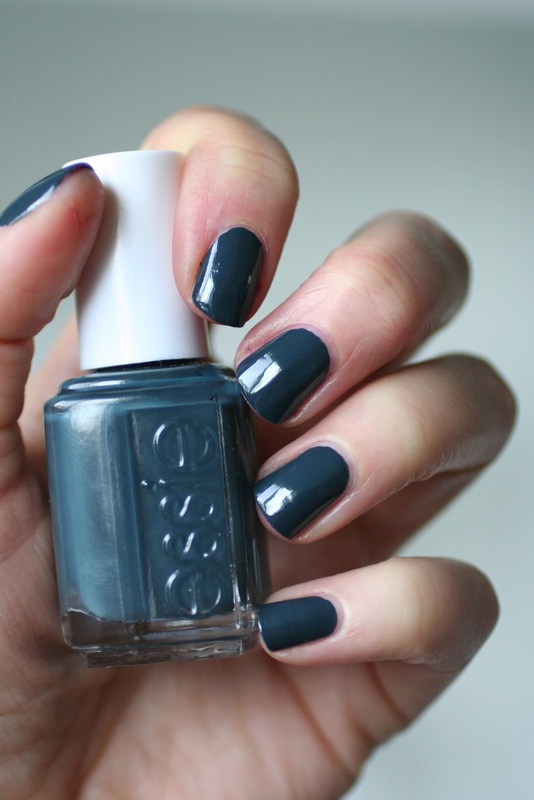 Not only is it a perfect Fall shade, but it has a perfect formula as well. You do need to apply your coat slightly thicker to get it completely opaque in one coat, but it's easy to work with and another home run formula. 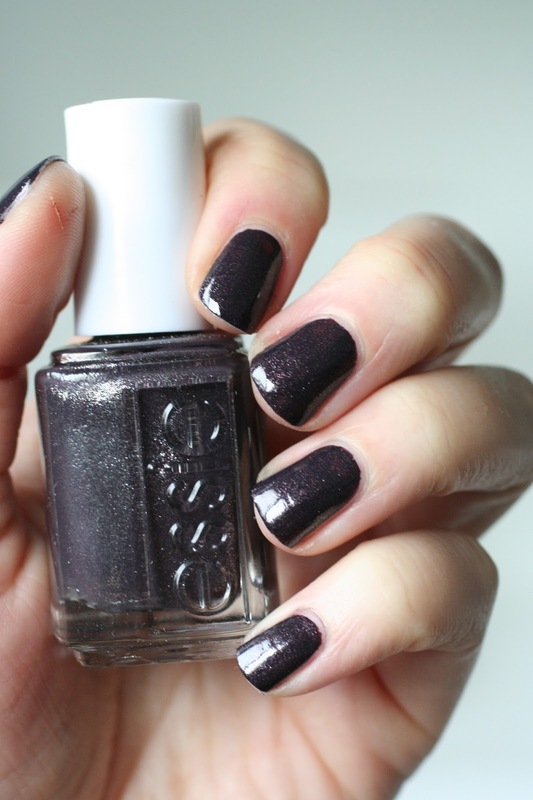 Another Fall 2015 release and another fantastic one-coat formula! All those tiny shimmer show up beautifully in this espresso-aubergine polish and it's another perfectly easy to apply polish in one (slightly thicker) coat. I was actually wearing a pair of cute sandals to church about a month ago and realized my polish was gross and chipped. I quickly removed it, slapped on one coat of Frock 'n' Roll and a coat of fast drying top coat and I was done in 5 minutes. I had amazing looking toenails in my adorable sandals, and to be perfectly honest...I'm still wearing it! I hauled this polish earlier this Spring from the dollar store of all places and I was SUPER excited. This particular red had been on my wish list since I first got into Essie polish about three years ago and I could not believe my luck that I found it for $3 and it was finally all mine! The cherry on top was when I went to apply it....are you kidding me?! It's incredibly opaque and creamy in one coat! 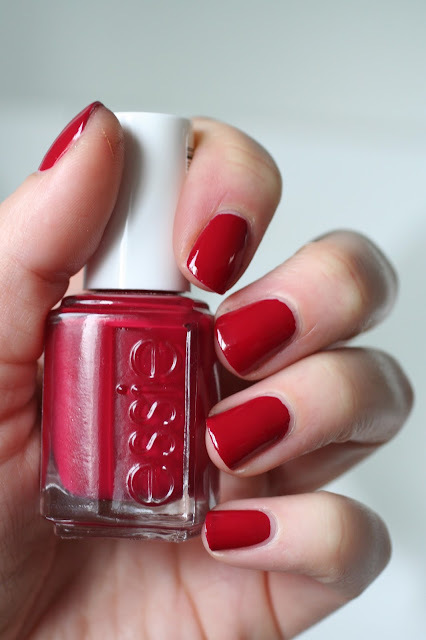 Reds from Essie are generally stellar formulas, but usually you can still see a bit of the nail line after one coat. Not with this one. If you apply just a tiny bit thicker of a coat, there's no visible nail line whatsoever and it's just a gorgeous deep berry red creme. My love for this polish continues. Now I should probably throw in a bit of a disclaimer and say that if you apply only one coat of polish, your mani won't last as long. It will chip easier, especially if you've skipped a base and top coat. But I still find these lists of One-Coat Wonders a great tool for the rushed, or just to know super spectacular Essie formula's in general. 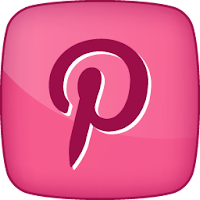 Do you have any favourite one-coat wonders? Does the Perfect Cover Up stain the nail? Yes it does a little Adry. Mostly just clings to any dry skin/cuticle making it a little blue when you remove it.